How often do we tell ourselves that food is evil, naughty and bad? A lot of the time! 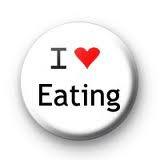 Lots of people who want to lose weight and sustain a healthy lifestyle have an unhealthy relationship with food. But if we stopped and started to look at food as our freind rather than our enemy, we really could be on to something and start appreciating food for what it is supposed to be. And how do you do that I ask you say? Well here are some tips! By giving your full attention to food without any distractions such as the tv or indeeed facebook (you know who you are 🙂 ) you’re engaging yourself with food which will lead to a much satisfying meal. You will recogniswe the signs when you are full and you will appreciate every delicious mouthful. If you can’t say nice things about your food, then perhaps it’s time to reevaluate what you’re putting in your mouth. You see if you’re eating chips and doughnuts on a regular basis you know that it’s not a healthy option and therefore you’ll be telling yourself that every time you eat it. So go out there and experiment a bit. Try new food, find new flavours, find new recipies that you can actually rave about. Not only will your food smell and taste good but you will know that it has great nutritional value. This one is close to my heart. I used to hide away in my room and gorge one chocolate after another. I was totally ashamed of what I was putting in my body and feared what people thought of me. So start eating food that you would feel comfortable eating in public. You will also be setting a good example to others. Then if you do want to eat food you normally hid from others, you can do so because you know you have eaten some healthy food too. And if you really can’t handle that, then you will eventually let go of this type of food. There’s something really satisfying about cooking from scratch. You’ve spent time and love over it and it tastes so much better than some ready meal processed junk. You know exactly what has gone into it. So make time for cooking and preparing your own meals and create a dining experience. You will make better food choices and over time it will lead to a healthier relationship with food. It’s a lifestyle not a diet! This entry was posted in Meal Plans, Nutrition, Weight Loss and tagged diet, energy, facebook, fat, food relationship, good food, greasy, healthy, junk, processed food, ready meals, tv dinners. Bookmark the permalink.